With so much emphasis on selecting major pieces of furniture for your baby’s nursery, you may not even have thought about the bassinet mattress your baby will be sleeping on. Yet the mattress that supports your baby while he or she sleeps is an important part of your nursery ensemble. In addition to determining the quality of sleep your baby will be getting – and in turn, the quality of sleep YOU’LL be getting – there are also important safety concerns involved in choosing a bassinet mattress. Even if you revel in your downy soft mattress, your baby needs a firm bassinet mattress to ensure proper support. Whether you select a foam or an innerspring mattress, it’s firmness, not thickness, that matters. Generally, a foam mattress needs to have a density of at least 1.5 pounds per cubic foot. 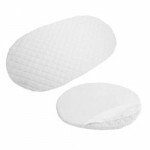 Innerspring bassinet mattresses should have at least 100 coils. No matter what type of bassinet mattress you choose, be sure it’s flame resistant. Any mattress which is flame retardant will indicate that on the mattress tag. And when measuring your bassinet mattress, it’s essential that the mattress fits the bassinet snugly, to keep the baby from sliding between the mattress and the outer wall of the bassinet. A simple guideline is to ensure that no more than one adult finger can fit between the mattress and the side of the bassinet. In addition to more traditional choices, many parents today are considering organic bassinet mattresses as an option for their baby. Once a novelty offered in only a few select sizes, organic bassinet mattresses have gained in popularity, and are now available from a large number of retailers. 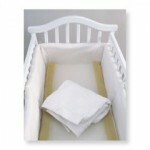 Most organic bassinet mattresses are made of organic cotton or food-grade polyethylene. By following these few simple tips, you can ensure that your baby will have the sleep he or she needs to grow and thrive on those first important months of life. This entry was posted on Tuesday, April 14th, 2009 at 10:09 pm	and is filed under Bassinet Guides. You can follow any responses to this entry through the RSS 2.0 feed. You can leave a response, or trackback from your own site.